I've been wrong so far regarding Monmouth Park on how much their handle would be up. I was thinking 50% when taking the fewer days and possible bigger field size. I wasn't taking into account that they would card more races though. All in all, they've pretty much doubled their handle after 2 days. Still a long way to go. Their takeout rate doesn't repel bettors, so the marketing that was put into this has successfully shifted some horseplayer money. They were ranked 10th by HANA when it comes to takeout score, with a 17% takeout rate on WPS, 19% on Ex's and DD's, a very low 15% on Pick 4's and their special 50 cent Pick 5. Triactors, supers, and pick 4's are still on the high side at 25%. Field size is up a lot. It will be interesting if this trend continues. The $1500 paid workout concept definitely attracts entrants. Whether that is good for the horseplayer or not, it is very hard to say. Will sore horses (who can get past the vet) be entered more often to run instead of taking the needed healing time between races? It isn't for the bettor's interest if a horse is just entered with the sole purpose of picking up $1500. The purses are deceptive. In lower level claiming races with big fields, only around 45% goes to the winner (because the purse amount includes the $1500 that gets paid out to those who finish in the bottom half or more of the field. I think luring Garrett Gomez has helped gain followers from across the USA. The quality of horse attracted isn't something to write home about. Using speed figures, I don't see allowance horses being a different caliber than what is found at other A tracks. Of course, the claiming events have horses running for deflated tags, which has been a great boon so far for the claiming game. So a $5,000 claimer is really a $10,000 claimer. It means that owners who have true 5 claimers, are just running for the $1,5000 in most cases. The high amount of claiming going on right now at Monmouth is great for the game. When the lower priced horses establish a sale price, it means that all horses increase in value. When horses are being claimed, it means there are a lot of eyes checking out the entries looking for value. It also means that more connections are likely to go to the track. What if Woodbine were to try this? First off, their purses are great to begin with. However, giving out half of what Monmouth does right now is only yielding them around 25%-33% of the handle Monmouth is getting. Woodbine's track takeout actually does hinder their popularity in a very large way. Check out this discussion about TVG and the feelings of the commenters regarding Woodbine's takeout. Of course, there is also the dirt versus poly issue, and it is pretty clear that there are people that hate artificial surfaces. I wonder what kind of affect guaranteeing $1000 or more a starter would have on Woodbine's entries. Their field size has usually been healthy, but this year especially, it seems that there are days where they are struggling to fill the card. I've always said that more money should be given to lower level horses, and less to the allowance horses at Woodbine. Keeping more owners in the game is a key to growth. And again, having horses run for their true value or even less than their true value ignites claiming, which is good for the track, and good for horse racing. I'm not a fan of the less is more philosophy. Racing's ultimate viability depends on having a the greatest number of people who make a living because of racing. Once dates are carved, a message is sent to the low level horsemen and owners to get out. And if enough get out, governments need to examine if the sport is necessary, and/or should be subsidized as much, or at all. I strongly believe that pricing of the gamble needs to be experimented with, long before the industry experiments with cutting dates. So they are going to try to focus on lessening the intimidation factor a newbie must overcome when it comes to handicapping races. That is good in theory. But this doesn't tackle the big issue: Why would anyone want to be a newbie handicapper/bettor in the first place? It isn't like poker where there are examples of long term winning players. Nowadays, if someone even becomes remotely interested in betting on horses, they do a Google search, and find a site like mine which tells the truth, that without substantial rebates, you just aren't going to beat the horses in any significant way, if at all. In other words, there is absolutely no good reason for a newbie watching Bet Night to learn the game when Woodbine has a 27% takeout on triactors, and a 26.2% takeout on Pick 3's and supers. I can see why someone would take up poker, but taking up horse racing through HPI and Woodbine? Gimme a break. Note to Woodbine: You need visible winners. You need to reduce takeout. I really want Fort Erie to make it, but since they haven't budged on their absolutely ridiculous takeout rates, to me, they aren't really trying. Sunday handle is a joke. Always has been though. They would do themselves a huge favor, and they would increase field size if they tweaked things a bit. Cut out Sundays, run 11 race cards on Monday and Tuesday, for a total of 24 a week, and with the extra purse money from eliminating 2 races, add that to the purses of the remaining 22 races. It was reported to me that jockeys are being fined like crazy at Fort Erie for excessive whipping violations. Jockeys can't whip more than twice in succession, and then there is a count in the stretch a jockey can't exceed either. Not sure how many times that is. This is affecting bettors too. On Tuesday in the fourth race, apprentice jockey Neil Husbands got fined for excessive whipping in the stretch. His mount one the race by a small margin, beating out a horse ridden by Mike Mehak, who wasn't violating the rules. In other words, had Mehak violated the rules (some can say cheat) and Husbands had not, the results would most likely been reversed. Should this type of violation lead to a disqualification? I think yes. If a jockey visibly uses a buzzer, and the stewards catch it in time, the horse would get thrown out I believe. There really isn't much of a difference in this case. The amount of the fine is also of concern. It is apparently the same at Woodbine as it is at Fort Erie. A $200 fine at Fort Erie to a jockey that wins a race is a much greater chunk of their share of their pay check than it is at Woodbine in most cases. How about making it one half to 100% of what the jockey makes on the mount? That would be fairer, and it would be a pretty decent deterrent which will keep jockeys playing by the rules. When it comes to whipping rules in general, I think bettors want jockeys to try to win if it take whipping 3 times in succession or 2 times. And it is probably true that some horses need to be whipped 3 times in succession, instead of 2. Here is a case of a harness horse getting claimed and then knocking off seconds from his life time best. It is way too suspicious. The horse in question is aptly named Real Joke. Guilty until proven innocent might be fine and dandy when it comes to the judicial system, but it is a great way to watch both watch honest horsemen and owners and gamblers disappear. Too many drugs in the sport today. And there are always trainers who are one step ahead of the testing barn. In Real Jokes case, it might have been the shortening of the hopples and the swimming that turned him around within a week or two, but most in the industry aren't buying it, nor should they. At Presque Isle Downs, a guy who banned himself from the casino had to forfeit winnings of $2,000 on a slot machine, and he was charged with trespassing as well. This post has some relevance when thinking about the idea of exchange betting coming to North America. I'll admit it, I like American Idol. Wouldn't dream of betting it, but that doesn't stop everyone from doing so. On Betfair, under special bets, one could place wagers on their American Idol selection, or book contestants they think will be voted off. It just came to my attention that after what appeared to be a knockout performance last night, that Crystal Bowersox was trading as high as 8-1 today, and wound up closing at 3-1. This means that nice guy Lee DeWyze will be announced as the winner within the next hour or so. It will shock the audience. But what is worse is that this shows the dangers of betting exchanges, especially when a winner is known to at least someone prior to betting being closed. Every gamblers dream is to bet after knowing the results. I'm for exchange betting, if done the right way. But whenever money is involved, larceny isn't far behind. I'm still not 100% sure DeWyze will win.....but mostly because I can't believe he could possibly of received more votes than Mama Sox. But Betfair picked the upset winner last year too. All it takes is one person to leak it out to a Betfair player, and it is free money. It isn't like there is a disconnect between a certain judge and England. Nick Eaves was recently on Trot Radio, and what he had to say was not very popular amongst harness horsemen in Ontario at all. He has pretty much concluded 100% that harness racing (even Woodbine Mohawk) needs to cut dates because there just isn't enough demand for the product. I'm not saying there isn't too much harness racing in Ontario today, but what gets me is that the element of pricing is huge when it comes to demand, especially today when there are all kinds of competition in the gambling industry. How can a reasonably intelligent sounding man, who runs a gambling empire avoid Economics 101 so much? It isn't just Eaves, but his predecessor as well, and virtually almost every race track exec in North America. To date, Woodbine Entertainment has not even attempted to find the OPTIMUM PRICE when it comes to takeout. Surely, a company that sells a product (gambling) in a competitive environment has to understand that at different track takeouts, you end up with different bottom lines. Take McDonald's for instance, they know that if they charge $3 for a Big Mac, they make more money in the long run than if the price was $6 or even $1. This happens with experience of moving prices up and down. The slot industry has found out the OPTIMUM PRICE as well through trial and error. Of course, it can be a little different in one place than another, depending on the customer base, but it generally always falls between a house take of 5% to 10%. At 15% or 20%, even though the patrons mostly don't have a clue about the slot payback rates, slot operators make less money in the long run because players go broke quicker, which works towards giving them a stronger negative experience. After all it is gambling, and if you walk into any place with a bankroll and lose it too quick, you'll find other ways to bet or quit betting altogether. The longer a player lasts, the more apt they are to expose friends and family to their gambling habit. This increases the bottom line of the casino....or hopefully, the racetrack when they finally discover OPTIMAL PRICING. Again, lowering takeout in horse racing is a long term thing. It isn't an overnight savior. It took 30 years for racing to find the bottom, now it is time for it to rise up again. Lowering takeout will help the momentum. Seriously, how can Keeneland have takeouts between 16%-19% and Woodbine have takeouts between 17%-27% if OPTIMAL PRICING has been attempted? One of the biggest crocks heard is that racing can't drop takeouts because the price of putting on the show is too high. Takeout price and the cost to run a track are two separate entities. The best way to illustrate this is using a slot operation. Slot operations are not cheap to run. Many are open 24 hours a day, 7 days a week, and employs many full time staff (employee benefits, maternity leave, etc.). It takes a lot of electricity to run these places as well. Lets say it costs $25 million a year to operate a casino, and lets also assume they at least break even at every hour of operation, so there is no need to cut hours. The casino has an average house take of 8% on their slots. This means, to break even slot players must bet at least $312,500,000 a year. At 8% they do find that people bet $450 million a year (yielding a profit of $11 million). However, at 10% where the break even point would only be $250 million, they find that people bet only $330 million, which yields a profit of $8 million. Now what does the cost of the operations have to do with how much people will bet? Simply, it doesn't mean squat. The slot operator, using OPTIMUM PRICING, realize that they make more money at 8% versus a 10% hold. The cost of the show is irrelevant, it could be $25 million, $10 million, or $35 million, it just doesn't matter. It is all about the the takeout rate or hold rate, and how much the customer loses collectively at different hold rates. More of today's customers are aware of track takeout when it comes to horse racing, but even if they weren't, the psychology of losing too fast will always be there. Horse racing needs to attempt to find the OPTIMUM PRICE point. Cutting dates first is just giving up without even trying, and just putting a band aid on the demand problem. In the Trot Radio interview, Eaves also made mention of the HIPS 2% (4% on triactors) tax that increases the takeout, a horseplayer has to pay. I think it is a great idea to change the way HIPS is funded, and take it out of slots instead. A 2% decrease on WPS and exactors and doubles would be great, if Woodbine can pull it off. A 14.95% takeout on WPS would be the lowest in the land, giving them a fantastic competitive edge. More importantly, getting rid of it off the parimutuel side would enable Woodbine to experiment with other takeout reductions more easily as well. I don't get his churn comment? Of course, in the old days when there were fewer exotics, and a lower collective takeout because of it, churn would be higher. But to say churn isn't that good anymore is a bit misleading. Horseplayers generally bet until it is all gone. They might play other tracks, but that is how it works. Also, the polytrack has led to bigger average payouts (thanks to bigger fields and the fact the polytrack creates more chaotic results than dirt), so fewer people are getting money to churn. So it might take the player who cashes a big super or tri longer to churn back, but they generally do so over time (the churn is coming back from fewer sources than in the old days). And the best churn days are when exactors pay $20 and winners pay a fin. But again, with most of the money coming from simulcast or ADW, people will generally bet the next race coming with the money they cash, regardless where they cash it, so sometimes Woodbine benefits, and sometimes it doesn't. It should be a wash in the end regarding timing of players cashing and betting back. When you take out $25 out of every $100 bet versus $16, there is going to be a lot less churn regardless. That is the bottom line. Incidentally, HPITV viewers may recognize Mike Maloney, as he has shown up on a video that HPITV airs having to do with handicapping. It is way too early to figure out if Fort Erie is going in the right direction, but it seems, so far, they are going in the same direction despite a publicized new attitude and new management. On the bright side, total handle is up 3% from $2,543,865 to $2,627,135 according to Equibase numbers. They have had one extra race this year as opposed to last year (why they added the race on a Sunday, their worst handle day and not Monday or Tuesday, is a complete mystery to me), so per race handle is only up 0.7% ($64,076 vs. $63,596 last year). 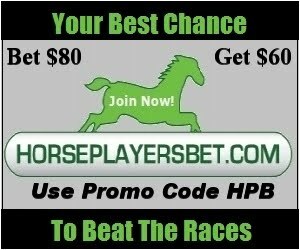 There is a trend right now as bigger rebated horseplayers are starting to shift some of their action from high distribution fee tracks (like Tracknet tracks) to tracks that sell their signal for a more reasonable rate, and Fort Erie is in a position to at least hold their own thanks to that. Live handle is pretty lousy right now (down 12.6%). Only $284,390 has been bet live this year versus $325,520 last year at this time, despite the one extra race this year. To be fair, live handle is down just about everywhere, but in Fort Erie's case, live bettors are extremely important, and they have a huge impact on sustaining current race days and purses, as horsemen get a much bigger cut on horseplayers who bet live (whether it is Fort Erie or another track on the simulcast menu). Field size has been a problem at most tracks this year as well. Keeneland dropped to under 8 horses a race this spring compared to over 9 the year before. Fort Erie's field size average is down from 7.87 horses a race last year at this time to 7.48 horses a race. Horseplayers generally bet more, the bigger the field size. They got hurt a bit on Tuesday, as 3 horses were vet scratched in the last race, reducing the field size to 5. Their last two races on weekdays, are their money makers, as they run up against the least competition at that time. It wasn't a great move to move post times to 1:30, instead of 1:45 last year (if anything, it should be 2 PM post times on weekdays), especially if they are only running 8 races on Monday and Tuesday. They need every edge they can get. That is why they should run the first race on Saturday at around 12:20 so as to get the horseplayers first betting dollars from across North America. Field size and handle numbers tend to increase considerably as the year goes on. Last year, field size average at Fort Erie wound up at 8.22 a race, while they averaged $85,439 in handle per race. Lets Compare Fort Erie To Finger Lakes, Shall We? There were three dates that apples to apples comparisons to Fort Erie can be made this year (Kentucky Derby Day and the past Mondays and Tuesdays). Unfortunately, Finger Lakes doesn't readily publish live handle so I can only compare total handle. In the three comparison days, total handle at Finger Lakes was $3,887,701 this year compared to $3,488,672 last year (an increase of 11.1%). $143,989 has been bet per race compared to $129,210 for the corresponding days from last year. Finger Lakes appears to be benefiting as well from the shift in wagering being done by rebate players. Field size has rose from 7.22 horses per race to 7.51 horses per race. For those three days, Fort Erie's field size dropped from 8.16 to 7.46 (still around Finger Lakes new number). Last year, Finger Lakes averaged $113,308 a race in handle for the year with a 7.79 field size. When comparing the per race handle, one has to ask what Finger Lakes does differently than Fort Erie. As a handicapper who uses speed figures, if anything, Fort Erie has the same or even slightly higher quality on average than Finger Lakes does. Finger Lakes runs a lot of State Bred races, including State Bred claiming races. These races do attract horses with lower speed figures most of the time. However, as a horseplayer, I find these races to be really good races to handicap, and I tend to bet more on them, especially if the field size is 7 or greater. Usually there are a couple of standouts, but there are usually fringe longshots, who lose by double digits in open races but have a chance against the lesser competition. The median average purse at Fort Erie was $10,422 versus $9,500 at Finger Lakes, but average purses given out per day at Finger Lakes was $122,564 versus $105,103 at the Fort. Finger Lakes runs an extra race per day than Fort Erie, and it has more allowance and Stake races, though I have never seen any evidence that B Allowance and B Stake races attract any more handle than claiming races with good field size. Finger Lakes is probably simulcast at more places than Fort Erie, including all the NY OTBs. This gives Finger Lakes a big edge if true. Finger Lakes is not surrounded by gambling competition like Fort Erie is, but since I don't know the live handle figures, it is difficult to analyze the impact. I find Fort Erie races in general to be more exciting, and less predictable most of the time. This can be a good thing, but also can be a bad thing when you start talking takeout. Fort Erie WPS 16.95%, Triactors 28.2%, All other bets 26.2% (including exactors and doubles.....yes, including exactors and doubles. Finger Lakes WPS 18%, Exactors and Doubles 20%, All other bets 25%. Finger Lakes wins this comparison hands down. You can't take 26.2% on exactors and doubles especially, and expect people to come back so quickly, if at all. In the old days (1960's and 70's) when there was no simulcasts, hardly any exotics, a live horseplayer could only play around 8 races, and mostly had to play WPS (at takeouts of less than 16% back then, I believe). Plenty left the building with money on them to go the next day. This kept the crowds in the game. There were even some winners around, and there was a buzz that the game could actually be beat. What Fort Erie does, with their high takeouts is make it impossible to get gamblers enthused or motivated to come back the next day. It is almost like they've given up. They also underpay customers on simulcast wagers. This is not good, and it gives punters even less of a reason to come to the track. They still assume that the focus is on a mindless crowd, and the key is to just bring them to the track. Great. Get them to the track, but you have to try to let them leave with something too, so that they might just come back. Horseplayers are not typical gamblers. Horse racing attracts thinking gamblers. And when it becomes over apparent that one has no chance gambling, they move on to other types of gambling that have much lower vig. Back to the comparison. Finger Lakes does not race on Sundays. Sundays are horrible handle days for Fort Erie, but they need to run at least one weekend day so as to allow the 9-5ers and their families a chance to make it to the track, including of course small owners. However, with the high takeout, and the hit and run mentality that is prevalent at most tracks these days, getting newbies or casual players to become more than that is futile. Might as well scrap Sundays for Wednesdays. I really want Fort Erie to survive, but they have to do things differently in order to attract their bread and butter: THE HORSEPLAYER. I don't see too many of the suggestions I wrote about in Fort Erie, The Future Is Now, being implemented as yet. The biggest piece of the management puzzle has been filled at Fort Erie. Rick Cowan, who brings a vast amount of experience with him, will now be running the joint. He ran Woodbine back in the early 80's, at a time when they didn't have slots, and were experiencing enhanced competition from the Blue Jays, lotteries, and finally charity casinos. The crowds were ample during Cowan's reign. I think a really good choice was made. A certain racetrack analyst at Fort Erie likes to stress a certain angle: Give horses a race before you bet them at Fort Erie if they are coming from Woodbine. It just didn't seem right to me, so I had Pull The Pocket get me some data using Jcapper software. When a horse ships in from another track to Fort Erie, and they have the top rated speed figs, they win at a 25% clip. The win rate is good, but the return is horrible, as these horses are vastly over bet and return 55 cents for every dollar wagered. If you bet all shippers making their first start at the Fort, you would lose over 26 cents on every dollar bet with a 14.5% win percentage. This is a strong loss considering takeout should only cause a 17 cent loss on the dollar. If the shipper came from Woodbine, the first race at Fort Erie produces a 15% win rate, and if you bet them all, you would lose over 28 cents for every dollar wagered. There is a slight increase when a horse makes its second start at Fort Erie. Win percentage goes up to 14.8%, while the return on investment (ROI) goes up to 75.6%. Still, losing 24 cents on the dollar is no way to beat the game. What this tells me is that value is to be had by ignoring Woodbine horses who wound up becoming Fort Erie horses. First start, second start, hardly a difference. They do OK on their fifth start (you only lose 10 cents for every dollar wagered), and you can actually show a profit if you bet them on their 11th start at the track after they shipped (a profit of 4%). I don't recall a year when the jockey colonies at Woodbine and Fort Erie had so many apprentice riders. I imagine the purses offered at Woodbine has made the idea of being a jockey more of a goal to people who weigh less than 115 pounds. But with so many on the scene this year, many are going to find that making a living is going to be next to impossible. And when it comes to weight making a difference, weight off probably matters least at Woodbine compared to other tracks in North America. Woodbine races are won by finesse and timing more than anything else. Very few races are won gate to wire on polytrack surfaces. When a horse gets a clear lead, weight off is an added bonus on dirt tracks, and as long as the apprentice is able to control the mount, the odds increase that the horse will make it to the wire on top. And in route races, weight off matters more, but usually when it comes to dirt strips instead of grass or poly. At Woodbine, jockeys like Chantal Sutherland, Patrick Husband, Eurico Da Silva, and Emile Ramsammy cannot be bettered by taking weight 99.9% of the time. So far this year, as expected, Omar Moreno is leading all apprentices at Woodbine in starts and wins. Though he is winning only at around 11%, he is hovering around 50% in the money. He is definitely the go to apprentice so far, for trainers looking for an extra edge. He loses his bug status in the fall. I like what I've seen so far from Betty Jo Williams. She seems to have the patience of a seasoned polytrack jockey like Chantal Sutherland. Ryan Pacheco's tiny frame makes him a perfect candidate to have a very good apprentice year. Again, he has been impressive so far with limited mounts. Brian Cheyne and Carolyn Duquette both lost their 10 pound bug early in the meet, and I expect them to struggle getting mounts at Woodbine. It is very hard to gain momentum and with that, the extra experience needed to become a colony mainstay when you are the 4th top rated apprentice or less on any circuit. horse races. Other 10 pound bugs include Marni Williams, Joe Sabetti and Dean Stimpson. 5 pound bug Beth Wyard also accepts mounts at Woodbine. There are more apprentices. With Fort Erie starting up, highly touted Bradley Wilson is back in the saddle. Cory Spataro, Mike Mehak, and Eric Edwards are also looking to make a name for themselves at the Fort. Lots of Woodbine based apprentices make the trek across the QEW to ride at Fort Erie when they have no mounts at Woodbine or when Woodbine is dark. So far, in the first 16 races at Fort Erie, the only apprentice to win has been Neil Husbands, who got his first career win on Sunday. Apprentices who don't get good momentum have it tough. Many don't get the chance to develop and it is hard to gain momentum when one gets lesser mounts. Former Fort Erie announcer Peter Kyte (still the announcer at Western Fair) has a blog: The Pete Sheets. I wonder what Simon Cowell would say about his performance? Fort Erie handle sucked on the weekend. They did nothing to address the fact that they have one of the worst track takeouts in North America, so going forward, I can't see things improving. On track horseplayers can't possibly last when betting into exactor and double pools that have a 26.2% takeout. When they don't last very long, they are less likely to come back any time soon. Might as well just have someone at the entrances with a Hoover vacuuming out customer's pockets. With handles up just about everywhere on Kentucky Derby day, Fort Erie was down 7% on live handle and over 20% off track. On Sunday, they were down 20% live, but were up 12% off track (still, total handle for Sunday was a mere $422,000, better than last year....but they can do a heck of a lot better if they understood the bettor. Tampa Bay Downs, a racetrack that has been reducing takeout over the years, showed a 5% gain for the year, bucking the industry trend this year. Here is a track that has gone pretty much doubled handle over the last 8 years. They now do over $4 million a day (almost double than what Woodbine does). Tampa Bay still needs to reduce takeout on triactors and superfectas (25.9%). Industry handle in down over 8% on the year, thanks to April not being as bad as the first three months. Being down 2.5% in April is no reason to celebrate nor is it something that should cause any racing exec any relief. Horse racing handle should NEVER drop. Every year, there are more and more people on this planet and every year the value of a dollar bill decreases at least somewhat (unless we ever have negative inflation). The Kentucky Derby numbers improved. Handle was up, so were the TV ratings (in fact, they were the highest they've been in 18 years). Now this could be reason for some optimism. But if horse racing only attracts handles on big days, it still doesn't bode well for the industry which depends on day to day grinding by trainers, owners, and bettors. Woodbine handle has been trending up lately thanks to TVG coverage in larger fields. They desperately need to do something to keep customers though, and this can only be achieved by reducing takeouts. Calvin Borel's stretch whipping of Super Saver didn't impress Stan Bergstein in the least. Who is the best horse flogger alive? Liam Hollins or Calvin Borel? Shame on Woodbine for paying less on place and show bets on Tioga Downs (which has a takeout reduction experiment going right now). As expected they are paying a lot less on triactors and supers, but place and show? There is something terribly wrong with what they are doing.